Alia Bhatt looks drop-dead-gorgeous in an ivory kurta and sharara set by designer Anita Dongre. Alia Bhatt and the team of Kalank are leaving no stones unturned in promoting their film which is slated to release on April 17. Wherever Alia is going to promote her film, she has been donning Indian attires and looked stunning in each one of them. 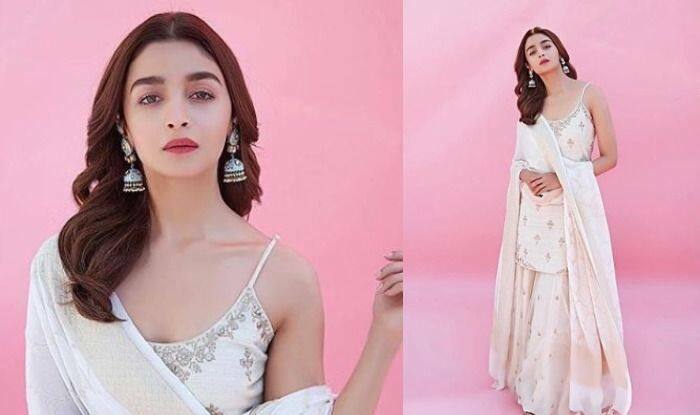 Recently, Alia Bhatt shared pictures in an ivory kurta and sharara set by designer Anita Dongre. Kalank is a film set in the 1940s during the time of India-Pakistan partition. Alia Bhatt will be seen playing the role of Roop. In the film, she is seen in heavy gorgeous ethnic outfits. While promoting her film Alia kept her look similar to Roops. For a recent promotion, Alia donned a stunning ivory embellished kurta and sharara set by Anita Dongre. With red lips and long oxidized earrings, Alia left her hair open. Earlier today, the makers released a new track ‘Tabaah Ho Gaye’ featuring Madhuri Dixit Nene. The song has been beautifully choreographed by Saroj Khan and Remo D’Souza. Madhuri looks ethereal, as always in the song with her poise and elegance. The film has an ensemble cast of Madhuri Dixit Nene, Sanjay Dutt, Alia Bhatt, Sonakshi Sinha, Varun Dhawan, and Aditya Roy Kapur. Directed by Abhishek Varman, produced by Karan Johar, Sajid Nadiadwala, Hiroo Yash Johar, and Apoorva Mehta, and co-produced by Fox star studios, the film is slated to release on April 17.